Nothing hails the arrival of a new year like the throngs of working class folk returning to work. It is akin to the march of penguins to sea after mating season, most would rather continue their romance (the men) while the rest (the females) are eager to resume their conventional lives. Scores of young females navigate morning rush hour traffic better than most NASCAR veterans. 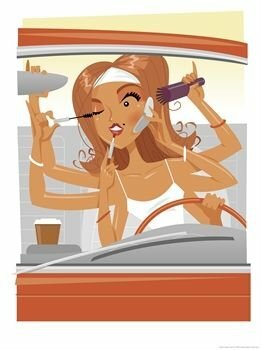 I witnessed a 20-something woman applying makeup while balancing her hot latte on the dash, discussing the misfortune of her social life with someone on her cell phone, all while changing lanes in traffic like a state patrol officer in hot pursuit. Rainy mornings greeted me for my morning commute; it was all I could do to see 30 feet in front of me as the spray from semi’s assaulted my sedan. In fact, I considered using a GPS to alert me to the bends in the road at one point. I have to remember that spring will arrive soon enough and better weather will replace its winter cousin. So the fledgling year is off to a good start for me despite the ever changing weather and traffic conditions I must confront each morning. For example, my favorite football team managed a final season victory that captured a place in the ‘second season’ for them. This is significant because they are playing the local NFL franchise this Saturday in the first round of the playoffs and my wife and I have tickets to attend. Although she’s been to a few Canadian Football League games in Canada, her excitement about it is something to behold. She will be wearing the local team colors while I will dawn the Christmas gift jersey of the visitors. I’m sure I’ll get the business from the faithful fans of the home team, and equally sure she will get offers from studly males to sit with them instead. My son is ready to return home to Phoenix from his Christmas holiday with me, he gets bored easily now. I gave him a video game of the TV show, ’24,’ he claims to be just one hour from besting it. I thought a new video game was a guarantee of challenges for months to come. The DVD of last years surprise hit movie, Transformers, has been watched enough time that he can repeat much of the dialog, another gift ready to collect dust. He occupies much of the evenings now by asking to play board games. When did this fascination start? Without much delay he starts board game cheerleading when I walk through the door at night. This weekend my son and wife return to distance places leaving me to reconciling with a quiet house again. As the time approaches for my son to leave I get irritable, I don’t like one bit that he will be far from me again. I realized this season that I am equally on edge at the thought of my wife exiting to Canada too. It sure didn’t take long for that to happen, fortunately I will see her next weekend, I can’t say that about my son. Perhaps my son will leave a race car driving game I can learn to play while balancing hot lattes on my lap, applying cream cheese to my evening bagel and talking to my wife on the phone planning next weekends social calendar. Happy New Year and remember to look before you change lanes. This entry was posted on Saturday, January 5th, 2008 at 4:23 am by Tim Hief and is filed under Blogroll, Uncategorized. You can follow any responses to this entry through the RSS 2.0 feed. Both comments and pings are currently closed.